First Appearence In Episode: Pokémon! I Choose You! Delia is the mother of Ash Ketchum. While waiting for her son's eventual return home, she tends to her normal life at home. Though she rarely sees her son and doesn't get to spend much time with him whenever he does come back home, she understands that his dreams are important to him and that he will come home soon. 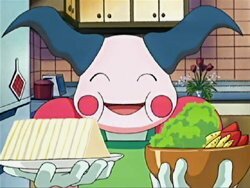 Delia currently lives with her Pokémon, Mimie, who had grown affectionate of her and takes care of daily chores around the house, including cooking and cleaning. 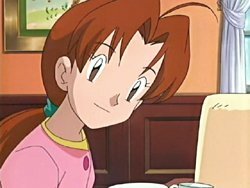 She also often visits Professor Oak's lab to check up on him and Tracey, usually to drop off a snack of give them company. The whereabouts of her husband are currently unknown and it is unlikely we will ever know who he is or where is at, as Delia has only made one mention of him early into the series. Delia is often refered to by several names. Before her official names (in English and Japanese), she was simply known as "Mama-san" and Mrs. Ketchum in both respective languages. The Japanese credits list her as Hanako, while the dub officially named her Delia starting in Movie 2. Mr. Mime was once a wild Pokémon that was being sought out by a circus ring leader in order to get her Mr. Mime jealous so it would actually perform, as opposed to loafing around. Because a Mr. Mime could not be found, Ash was forced to dress as one to catch its attention but was kidnapped by Team Rocket, mistakening him for a genuine Mr. Mime. Ash made his escape and went home to suprise his mother, who had mistakened Mimie for her son. She soon became attached to the Mr. Mime, as did it with her. After everything had settled, Mr. Mime chose to stay with her and she had named it Mimie (Bari-chan, in the Japanese version). Mimie mostly does chores around the house as opposed to battling, though it will help with its abilities from time to time. Mimie will also only listen to Delia and will occasionally ignore or argue with anyone else who attempts giving it orders or interferes with its tasks, including Ash.